Private First Class (PFC) Rick Adler, U.S. Army, grew up two streets over from me on Elizabeth Lane in Olmsted Falls, Ohio. I didn’t know him then—he is ten years older than me. I should have known him—I learned to swim at the pool his family owned at the corner of Fitch and Cook Roads. But at ten years old when I was swimming laps and playing baseball with my friends on warm summer Cleveland afternoons, Rick Adler was trudging through the mountainous triple canopy jungles of Vietnam just trying to keep himself and his buddies alive. He succeeded, but at great personal cost. 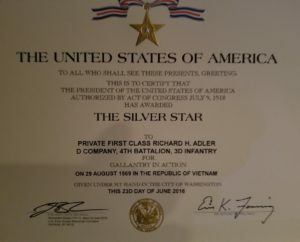 Forty-seven years, one month and one day after he was evacuated from a battlefield commonly known as the “Rice Bowl” south of Chu Lai in the Republic of South Vietnam, our nation recognized him by awarding him the Silver Star. This is his story. Rick was born on January 2, 1948, and grew up in Olmsted Falls, a half-farm, half-suburban community located approximately 20 miles from downtown Cleveland. He graduated from Olmsted Falls High School in 1966 and headed to Bowling Green State University in the fall. He neglected to do a couple of things once he got there, namely going to class and studying, so Bowling Green politely invited him not to return. He decided school wasn’t for him, so around March of 1968, he started to work at DairyPak, a large employer in Olmsted Falls. All was going smoothly until he and two of his high school friends, Dave Fenderbosch and Larry Lanford, were drafted. Rick reported for duty and was sworn into the Army on January 27, 1969. He was sent to Fort Jackson, South Carolina, but was only there for a day or two. Then he and Larry were sent to Fort Gordon, Georgia, for boot camp and Advanced Infantry Training (AIT). Boot camp was tough, but it had to be since the new soldiers would be heading to Vietnam as soon as they graduated from AIT. The drill instructors taught Rick and the others discipline and how to react instinctively without having to think. Rick is certain the lessons he learned in boot camp helped him survive his tour in Vietnam. After completing AIT, Rick flew to Vietnam via Fort Lewis, Washington. He arrived in Vietnam on July 9, 1969. 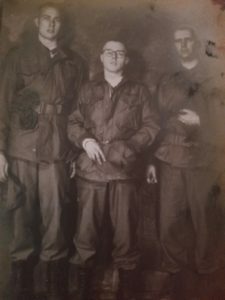 He was sent to Chu Lai and assigned to the I Corps area of operations, which included the northernmost provinces of South Vietnam, just south of the DMZ. 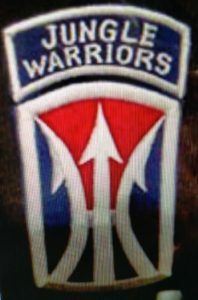 Rick’s unit was the Americal Division; specifically, the 4th Battalion of the 3rd Infantry Regiment, which was part of the 11th Light Infantry Brigade. Rick was directed to join his company, the “Jungle Warriors” of Delta Company, at Fire Support Base Bronco in Duc Pho. Rick and Delta Company patrolled the triple canopy jungle in the mountains, where it was a free fire zone. That meant any enemy forces could be immediately engaged without further guidance from the chain of command. 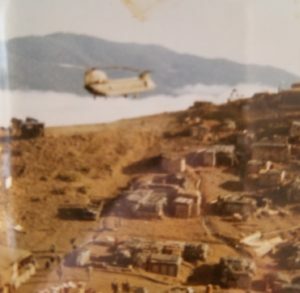 Shortly after arriving in Duc Pho, Rick was “choppered” (flown by helicopter) to the fire support base known as as San Juan Hill. Their position on the mountain was up so high that they looked down on the clouds. The first night, North Vietnamese Army (NVA) sappers tried to infiltrate San Juan Hill. Three sappers were killed. That night, the reality of being in Vietnam hit Rick for the first time. After that, firefights with the enemy became routine during Delta Company’s many patrols, ambushes, and search and destroy missions. Life in Delta Company took on a familiar pattern. The unit would deploy to the bush for between 21-30 days, return to San Juan Hill for 4-5 days, then head back into the bush for another 21-30 days. 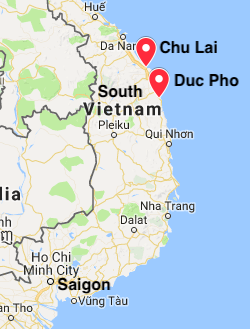 After the second 21-30 day stint ended, the Company would be pulled out of the bush and sent to Chu Lai to decompress, where they were treated with beer, booze, steaks, and South Korean girl bands. They could even swim in the South China Sea. After 3 days of relative safety in Chu Lai, they would return to the bush to start the entire cycle over again. The seven days that are forever etched in Rick’s mind began on August 23, 1969. They were choppered to the low lands, largely made up of rice paddies and known as the “Rice Bowl”, to join up with a mechanized unit of the 1st Squadron of the 1st Cavalry Regiment (1st/1st Cavalry) that included tanks and other armored vehicles. That night, the 1st/1st Cavalry had what they called a “mad minute”, where they unleashed all of their weapons on the area surrounding the camp for 1 minute. Rick and the men of Delta Company didn’t understand what was going on, as stealth and surprise meant everything in the jungle warfare they were accustomed to. They asked, “Aren’t you giving our position away?” The 1st/1st Cavalry responded, “The NVA already know where we are—we’re just letting them know what we’ll let loose on them if they try anything.” After that mad minute, the camp was hit every night with NVA mortars. The reason Delta Company joined the 1st/1st Cavalry was to search for an underground NVA hospital complex known to be in the vicinity. When Delta Company joined up with the 1st/1st Cavalry, it had 110 men. They were to set out on the morning of the 29th to find the hospital complex, with the 1st/1st Cavalry going in one direction and Delta Company in another. The night before the 29th, the NVA hit the U.S. position hard with mortars and there were many casualties. Then on the morning of the 29th, before Delta Company set out, an NVA soldier surrendered and was interrogated. He said if Delta Company wanted to find the hospital complex, they needed to take a different route than planned. The information was passed up the chain of command and direction came back to use the intelligence provided by the captured NVA soldier. The result was Delta Company walked into a horseshoe ambush, where a battalion of 500 or more NVA soldiers attacked and closed off the horseshoe to block Delta Company’s exit. They were completely surrounded! The ensuing battle lasted 8 hours. The NVA threw everything they had at Delta Company – including mortars, rocket-propelled grenades, machine guns, and small arms fire. As soon as the firing started, Rick rushed forward to help establish a defensive perimeter and was wounded by an NVA mortar round. Despite his wounds, he successfully defended his position over the next several hours and eliminated several enemy soldiers. He also helped redistribute ammunition and encouraged his fellow soldiers to fight on. He was subsequently wounded a second and third time, but refused to leave his position until he could no longer move. It was then that his friend, PFC Gary Burka, saw that the NVA were zeroing in on Rick’s position with mortar fire. He ran forward and dragged Rick to safety, but was himself seriously wounded during the rescue. Moments later, when they were no more than 10 yards away, Rick’s former position took a direct hit from an enemy mortar round. Had PFC Burka not helped Rick precisely when he did, Rick would have been killed. PFC Burka was awarded the Silver Star for his actions. Ultimately the NVA disengaged after being pummeled by ordnance from 4 F-4 Phantom jets flying overhead, 7 helicopter gunships including Cobras and Sharks, Army artillery from every landing zone and fire support base that could reach them, and even a Navy ship lobbing in shells from off the coast. The 1st/1st Cavalry was also instrumental in breaking the assault by arriving on scene with its armored vehicles and massive firepower. The assistance came just in time as the men of Delta Company were running out of ammunition and water. By the end of the battle, only 64 of Delta Company’s original 110 men remained in the field. Rick was evacuated to a hospital in Japan to recover from his wounds. Because he was wounded in combat, if his hospital stay in Japan lasted 61 days or longer, he would be sent home. He was conflicted about wanting to go home and going back to rejoin his Company because he didn’t want to leave his buddies behind. The Army resolved the dilemma by discharging him from the hospital on day 60. Rick returned to Delta Company to finish out his tour. Rick had one other significant event chiseled into his memory. On April 2, 1970, soldiers from Delta Company (not including Rick) and members of another company, Alpha Company, returned to an abandoned night defensive position, not realizing it had been booby-trapped. A massive explosion followed, killing 8 soldiers and wounding 20. Rick lost one of his best friends that day, Sergeant Mike Borges, a 19-year-old soldier from California. Rick describes every day in Vietnam as a bad day, but some days were worse than others. Rick and his buddies used humor to survive the rough times, like pulling out the stopper from a sleeping friend’s air mattress during the monsoons so he’d slowly sink into the mud rising around him. Looking back, Rick and his buddies realize they lived like animals; dirty, bloody, never bathing or changing clothes, and going without food. On top of that, the NVA were trying to kill them. Still, they did the best they could to play the hand God dealt them. In the end, it came down to making sure the guy on the left and the guy on the right made it home safely. Rick completed his 1-year tour and left Vietnam on July 8, 1970. He finished his Army commitment at Fort Carson, Colorado, and returned to Olmsted Falls. He went back to DairyPak, where he worked for the next 25 years and, after retiring from there, began a successful career in real estate. He has 2 children, Matt and Amy, and he and his wife, Sharon, are retired in North Ridgeville, Ohio, although Rick’s heart is and always will be in nearby Olmsted Falls. 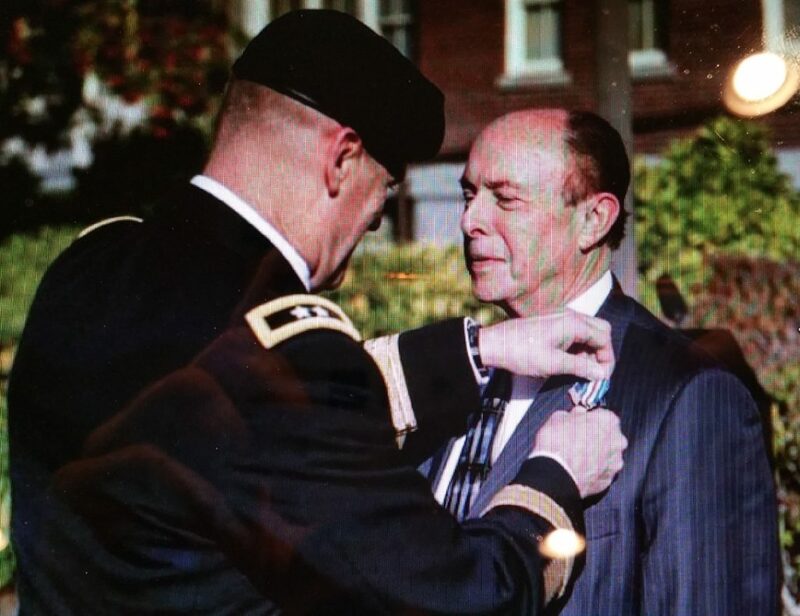 On September 30, 2016, at Fort Lewis, Washington – 47 years, 1 month and 1 day after the day Rick and his unit successfully fought off the attack by the NVA battalion – Rick and the friend who saved his life, Gary Burka, were awarded the Silver Star, our nation’s 3rd highest honor for “gallantry in action” and “personal heroism.” Rick insists he was not a hero; he was just doing what he had to do. During his acceptance speech, he recognized the more than 58,000 Americans who never returned from Vietnam as the true heroes and the ones who must never be forgotten. As we were wrapping up our discussion, Rick relayed a story about talking to a friend’s son who wanted to join the Marines. He told his friend he wouldn’t try to encourage or discourage his son from joining, but would simply tell him the facts. He told the young man that combat changes you forever and you will never be the same as you are today. As they spoke, they heard thunder in the distance. Rick asked the young man what he heard and he said it sounded like a storm approaching. Rick said that’s what you hear, but I hear artillery prepping an area for assault, or mortars exploding, or the call to get on a chopper to help bail out some unit that’s in trouble. Rick told the young man those memories will stick with him for the rest of his life. One other thing that has stuck with Rick are the effects of Agent Orange. Since Vietnam, he’s battled Stage 3 and Stage 4 Non-Hodgkins Lymphoma, and had to endure a stem cell transplant, all resulting from his exposure to Agent Orange. Rick tells those who ask about it, he’ll die with cancer, but not because of it. 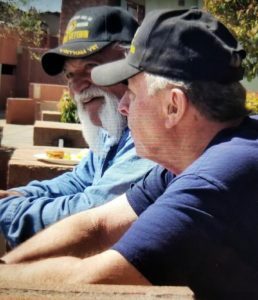 Over the last few years, Rick has reconnected with the Jungle Warriors from Delta Company and they’ve even had a reunion in Sedona, Arizona. After not hearing or seeing each other for nearly 50 years, they picked up right where they left off. Rick also recently came across the letters he wrote home from Vietnam—his mom kept every one. Not only that, but she mailed him a letter every day he was in Vietnam. The letters brought back lots of memories. Rick now visits schools to talk about his service, and recently spearheaded an effort to make sure another graduate of the Olmsted Falls High School Class of 1966, Gary Martell, who was killed in action in Vietnam, received the community recognition he deserved. 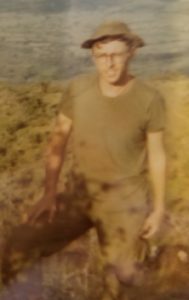 Voices To Veterans proudly salutes Private First Class Richard H. Adler, U.S. Army, for his extraordinary service in Vietnam. While we can never repay Rick for the sacrifices he made, we truly thank him and the Jungle Warriors of Delta Company for their service.